We're always looking at what's on the horizon in health care so that you'll be ready to adapt to technological advances in nursing. Our Christ-centered, professional faculty have dedicated their lives to equipping you. You'll get a high quality education in medical surgical courses and all specialty areas including: critical care, obstetrics, pediatrics, mental health and community-based learning. And our graduates are successful — in fact, 100 percent of nurses who graduated from our program are working in their health care careers. Research shows 79.6 percent of employers want BSN-prepared nurses. And lower mortality rates, fewer medication errors and positive outcomes are an outcome of nurses prepared at the baccalaureate level (AACN, Oct. 2017). So take advantage of the convenience of gaining experience and connections right here in the health care capital of the U.S. “Practice before you practice" in our on-campus, state-of-the-art high fidelity patient simulation lab. You'll be well-prepared when you get the chance to serve on medical mission trips at home and abroad. Our faculty will tell you nursing is a rewarding career. It always gives back. Whether you decide to grow in the profession with more degrees or you're content where you are, you'll always be able to serve as a nurse. And you'll always be able to provide a steady income for yourself and your family. "Even when a nurse leaves the profession for an extended period of time, as long as you keep your licensure current by taking the appropriate review courses, you'll be able to return to the profession," executive director Dr. Ruth Corey says, "which only proves once again that nursing will never fail you." We believe education should be a product of research and the latest in evidence-based practices. So we designed our curriculum with the guidance of faculty nurse educators who understand what is needed in modern health care. And we will help you transform into a knowledgeable, competent, trustworthy and hardworking nurse. We’ll show you how to be a stabilizing factor that patients can count on. And as a high-quality nurse, you'll be able to go further to excel in a complicated profession and fulfill a much-desired need. We've designed this course to prepare the senior nursing student to enter into professional practice. It explores issues that are pertinent to the practicing nurse and establishes the importance of participation in professional organizations. The course helps students to design a portfolio and CV for their first interview. It also contains the preparation and development readiness to sit for the NCLEX licensure exam. Applicants will be admitted to the upper division nursing major after completing all pre-nursing prerequisite requirements. Admission is conditional upon successful completion of any outstanding requirements. Undergraduate pre-nursing grade point average: Applicants must have at least a cumulative 3.0 GPA in the prescribed 66 hours of pre-requisite course work for the nursing program. 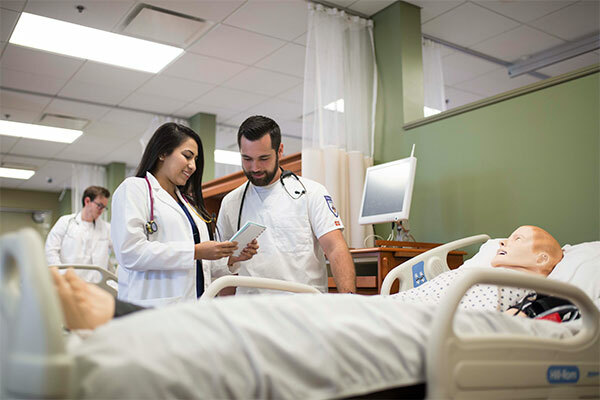 For fall enrollment all coursework must be completed before beginning the nursing program as students typically enter their junior academic year. Please note: A student nurse must maintain a “C” average in any specific prerequisite course required for the nursing degree and in addition, must have a "B" grade average in the five prerequisite science courses listed below. Transfer pre-nursing students: Applicants seeking entry must each meet the same academic requirements in the core pre-nursing curriculum as Lipscomb students as noted in the paragraph above. Lipscomb only accepts transfer science courses with a minimum grade of “C” or higher. The “B” average requirement in the pre-nursing science courses also applies for transfer students. Transfer students will be required to meet graduation Bible course requirements, chapel requirements, as well as SALT requirements. These will be determined based on past courses and degrees earned. Lipscomb participates in the Tennessee Transfer Pathway program. Complete your supplemental nursing application: Applications must be submitted electronically via the Lipscomb nursing website. Please read the instructions carefully to be sure the application is submitted properly. The fall application deadline is December 1. The spring application deadline is September 1. Transfer applications received after December 31 will still be considered on an individual basis. There is a $25 nonrefundable application fee that must accompany the application. Payment can be processed online at the time of the application using a debit or credit card. Submit a goal statement: a concise statement of your career goals as a nurse is required and may be uploaded with your application. Obtain three reference letters: the student’s references must be from the following: two letters from collegiate faculty members and one personal reference (cannot be a relative). The following must be completed after receiving your acceptance to the Lipscomb University School of Nursing. An unsatisfactory result in any of the categories below may disqualify you from admission. Health History-documentation of appropriate immunizations must be submitted prior to course registration. Drug Screens and Background Checks-completed annually during enrollment through a third party testing facility. Additional drug screens may be required in accordance with the policies of clinical placement sites. CPR Certification- BLS-Health Care Provider- must be provided through the American Heart Association. A copy of your CPR certification card must be provided prior to the beginning of class. Medical Terminology online course is required for all pre-nursing students before entering the nursing program.